In Macedon, war rises like smoke, forbidden romance blooms and ancient magic tempered with rage threatens to turn an empire to dust After winning his first battle, Prince Alexander fights to become the ruler his kingdom demands-but the line between leader and tyrant blurs with each new threat. Meanwhile, Hephaestion, cast aside by Alexander for killing the wrong man, must conceal the devastating secret of a divine prophecy from Katerina even as the two of them are thrust together on a dangerous mission to Egypt. The warrior, Jacob, determined to forget his first love, vows to eradicate the ancient Blood Magics and believes that royal prisoner Cynane holds the key to Macedon's undoing. And in chains, the Persian princess Zofia still longs to find the Spirit Eaters, but first must grapple with the secrets of her handsome-and deadly-captor. 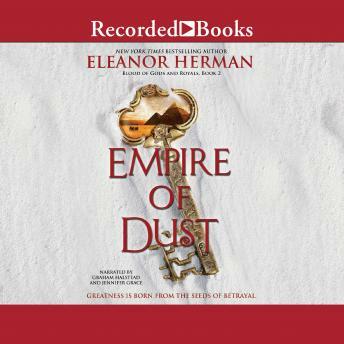 New York Times bestselling author Eleanor Herman entwines the real scandals of history with epic fantasy to reimagine the world's most brilliant ruler, Alexander the Great, in the second book of the Blood of Gods and Royals series.